How can one little cat touch so many people so deeply in so little time? Sal was one of the special ones. For those of you who have been following, I have sad news. Sal was helped to the Bridge yesterday. I burst into tears when I heard. Thick, blubbering tears. And I've burst into them more times than I can count in the hours since then. How can one little cat work his way into your heart so fast? 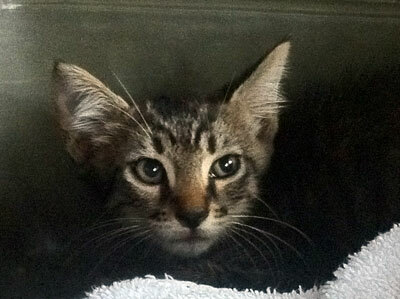 On July 5 last year, a couple friends and I rescued Sal from inside a Mustang's engine in our office parking lot. We called him Mustang Sally until we realized he was a boy. So then he was Sal. This video is him when we first got him out and safe in a carrier. It took us hours to get him out of that engine. Poor, tiny scared thing. Luckily, my good friends at Cats Exclusive had room in their foster program to take him in. He was perfect. His foster mom fell in love with him and we all suspect she kept a little extra saying he needed "more socialization time" before bringing him in to the adoption center -- because she loved him so much and wanted to extend his stay with her. He had that effect on people. Once he got to Cats Exclusive, it was clear this boy was a love bug. He was perfect! Love, love, love. Sal cuddled up with his best buddy, Smokey. One of the techs even seriously thought about adopting Sal himself. He had that effect on people. Then somewhere along the line in the next few months, he developed a neurological issue and lost control of his back legs. He was happy, though, and checked out healthy otherwise. He purred and played and didn't seem at all affected by his wacky legs -- a little frustrated sometimes, maybe, but not bothered. His wobbly legs only made people love him more. This perfect boy was still perfect and he just weaved his way deeper in everyone's hearts there. The techs and everyone who worked there all gave him special attention and he was an obvious favorite. He had that effect on people. He was weak and I could see what she meant. But he was still purring like mad, still loving. He'd had some additional blood tests and it turned out that something was low (his platelets maybe?) and they put him on a medicine to fix that. Within a week, he was back to his old "special" self! Yay! I went over to visit him again -- just this past Saturday -- and it was almost a miracle. There he was holding his head up high, drinking water, eating food and scooting around! This is a video of him scooting. You'll see when you watch it. He'll have that effect on you. Cute, right? Gah, I wanted to gobble him up. He spent most of my two-hour visit curled up in my arms or my lap. Purring and just looking at me. I spent most of that two hours just thankful that he was getting better. He had gone from death's door to his playful self again, and everyone was optimistic. They decided to keep him on that medicine for another month to see if he could even improve more. And then we could do physical therapy! And he could get even stronger! Everyone was Team Sal. Here he is playing with a fishy toy that day. He didn't care that his back legs don't work well -- he was just a normal cat! I left covered in cat hair and just so happy. I assumed he was in the clear. But today I got an email from the shelter manager, because she knows how much I loved him. The subject line just said "I'm so sorry" and I knew before I even opened it. I read it in tears, squinting just to see the words. Sal was losing everything and they couldn't watch him completely go to nothing. They were all in tears. He is an angel in Heaven. She thanked me for bringing him into their lives. I was so sad and mad at the same time. I would have been there with him when he went. I wish they'd told me first. But I don't know how bad he was, and maybe she thought she was protecting me. And I was SO happy that I'd just been with him and had such a special visit less than a week before. I truly know they did all they could for him and wouldn't have made that decision lightly. Me and Sal hanging out last weekend. We were a pretty cute pair, huh? How one little cat can have such an impact on someone, I don't know. I've probably spent less than seven hours total with Sal and I'm just as sad as if I'd lost a cat who I'd had for 20 years. I wish we could have done more for him. I wish there had been a magic cure. I wish I'd brought him home with me so he'd have at least had a real home for a little while. I'm sorry for getting so sad in posts like these. They help me. I like to have memories recorded, and it helps to write out my feelings. I was just going to post a couple pictures and videos, but then I got to typing and I wanted to do it right. For Sal. You're an Angel in my book for all you do for kitties like Sal. Bless you. Cats like Sal are one in a million. I lost a kitty like Sal back in October. I called her Li'l Kitten. She left a mark on everyone she met. I saved her from being euthanized as a kitten. She was a "special needs" kitty who required a lot of extra care but she never complained. No matter how sick she was, she would always be purring and full of love. She taught me to fight through my battle with cancer and never left my side. I don't like to play favorites, as I have three other cats, but she was truly one in a million. I'm so sorry for your loss. What a sweet little guy. Yes, he does have that effect on a person. Very much so. He's running free again. I'm so sorry for your loss -- he was a magnificent cat. I'm so sorry, Dorian. What a wonderful tribute you wrote to this sweet little cat. His memory will live on through your words, even for those of us who didn't know Sal. I am so deeply saddened and touched by this story...it reminds me of NomNom's a bit...that "I am going to be happy and love you and purrrrrr my heart our no matter what my legs are doing! "(Hers were both broken :(). I am glad you got to spend quality time with this one of a kind angel and were brave enough to post this so soon...I am grieving with you and for you. He is chasing that fish with PUUUURFECT legs today!! If you want to know how things turned out with Nom..private message me. I do not wish to share it publicly. Thanks and thinking of you during this difficult and puzzling time. My sympathies are with you. We love all our furry friends but let's face it, some are more special than others. I hope you can comfort yourself in at least knowing you and others made a huge difference in his short life, giving him love and care. I'm so sorry for your loss! Prayers, purrs, and wags are on the way from Philly for all who love Sal. ate well......and most importantly.....he was loved so much!! My sympathy to all....and bless all who gave Sal a "home". Oh, I'm so sorry to hear this. And don't worry about getting sad in posts - it allows us to see even more of your kind, caring heart. So sorry to hear about Sal. He was well loved by all, included all of your Cute followers Dorian. I am so sorry. He seems like an awesome cat. What is that saying, "it's not the years you have in your life, but the life you have in your years . . . " Well, Sal had a lot of life in his short time on this earth - and a lot of love! He gave a lot of love and got a lot in return, "real" home or not! We are never ready to let go, but the bond remains . . . forever, whether we cared deeply for 20 days or 20 years. And now he runs without wobbling and plays and purrs and is free of all of the challenges he faced in his short life. Sal was really a wonderful and brave kitty. My deepest sympathies to all who loved him and will sorely miss him. I too had to cry while i read your touching story.So sorry that you couldn't be with him before his trip over the rainbowbridge. But you're right, maybe it's better to remember Sal like he was at your last meeting with him. I can only pray that my two babies will remain for many years with me. I'm so very sorry. Thankfully, Sal had you, and he had his pals at the center. They can never be with us anywhere near as long as we would like, but you may smile thru the tears when you think of him because even tho his time was short here, he was so happy, and so loved. So many dear kitties don't even get that. Bless his dear soul. I saw a cat in my yard today that I've never seen before. I ran outside and he came right up to me, what a love! I noticed he is intact. I may have to snag him and take him to be neutered. A sweet boy he is! Wish me luck, I've never done this before. 'Hope he comes back soon. i am so choked up Dorian and my heart hurts for you and sweet Sal. I didn't realize when I saw your post at first that THis was THE sale from the Mustang. You gave him a WONDERFUL life where he was adored! I'm so happy you had time to spend with him last weekend. I LOVE that photo. Sweet baby. I can't stop crying. What a little cutie Sal was. Thank God for caring people like you Dorian, and the staff at Cats Exclusive. I'm so happy you were able to spend the day with him. So, so sorry, Dorian! Comfort yourself knowing you gave him the gift of love and loving people around him during the final months of his short life. Terribly sad about Sal. I am so sorry that Sal had to go to the Bridge. Rest in peace, Sal. You were a Very Good Boy. "Prayer for Animals --Hear our humble prayer, O God, for our friends the animals,especially for animals who are suffering;for animals that are overworked, underfed and cruelly treated;for all wistful creatures in captivity that beat their wings against bars;for any that are hunted or lost or deserted or frightened or hungry;for all that must be put death.We entreat for them all Thy mercy and pity,and for those who deal with them we ask a heart of compassionand gentle hands and kindly words.Make us, ourselves, to be true friends to animals,and so to share the blessings of the merciful.- Albert Schweitzer "
So, so sorry Dorian.....know and feel your heartbreak. Hugs to all. I am so sorry about Sal. :( I didn't know him, but your post, photos and videos helped me to understand what a special boy he was. We are sending love and purrs. Sal must be in kittie heaven with all of the other special kitties.I just read his story and I am sheding tears as I write this. It's hard, but to know he's in a better place can somehow help us to feel better. RIP dear little Sal. We love you! so sorry to hear about Sal. He was very lucky to crawl into that car in your parking lot. You and all his other caretakers made his life wonderful and full of love. Thank you for sharing. He was a Very Very good boy. <3 Every boy should be so good. Me too! I hadn't even planned it, I just had some time so I stopped by. So happy I did. :) I'm glad I could share him with you. We all get to love so many more kitties by knowing each other. Thanks, Rebecca. Sometimes I think I feel too much, but it's the only way I know. :) Not a bad thing. Li'l Kitten sounds like she was a perfect girl. Thank you for saving her!